Do you play an instrument — guitar, bass, keyboard, hand drums, ukelele, fiddle, something else…? Will you be in town on Friday night, August 28th? And/or: would you be interested in being part of a Shabbat band for evening or morning services a few times a year? If the answer to any of these questions is yes, let Rabbi Rachel know – email rabbibarenblat at gmail dot com. Thanks! Shavua tov! Looking forward to Shabbat Naso. Shavua tov – a good week to you! This week we’re reading the Torah portion known as Naso, from the book of Bamidbar. In English, we call this book “Numbers,” but its Hebrew name means “In the wilderness,” which is where most of the book takes place. And here’s the URJ’s compilation of commentaries on this week’s Torah portion: Naso | URJ. This coming Shabbat morning, services will be led by Rabbi Lori Shaller. For those who are wondering what we’ll be studying on Saturday night, here’s the schedule for our tikkun leyl Shavuot. Join us for some or all of our learning! We’ll begin at 8pm with a festival evening service and then continue late into the night. Is Orthodox Judaism Compatible With Feminism? Sinai: Ascension of the Chosen? Are we a people who are chosen? What does “chosen” mean to us? Is “chosen” the same as “commanded”? In days of old, the three biggest holidays of the year were the Shalosh Regalim, the three pilgrimage festivals when we would walk to Jerusalem to make offerings to God at the Temple. One of them was Sukkot, the harvest festival we celebrate in the fall. One of them was Pesach, the festival of liberation we celebrate in the spring. And one of them was Shavuot. In those days Shavuot was known as the Festival of First Fruits. On the second day of Pesach we planted spring barley, and counted 49 days, and then harvested it and brought it to the Temple on the 50th day as a gift of gratitude to God. Once the Temple was destroyed in the year 70 C.E., our sages reinterpreted Shavuot. Shavuot, they said, was the anniversary of the day when the Torah was given to us at Sinai. They taught that all of our souls were mystically present at that moment to receive Torah… and that when God spoke, each person heard it in a language and an idiom and a style which they could understand. Of those three great pilgrimage festivals, the one which most of us know well today is Pesach. (Studies show that almost all Jews celebrate some kind of Passover seder.) And many of us are coming to know Sukkot once again, and to enjoy the deliciousness of meals savored outdoors in the fall beneath the sukkah’s leafy roof. But many of us do not have experiences of Shavuot. Shavuot is the culmination of a journey we began at Pesach. At seder we celebrated our liberation from Mitzrayim, “The Narrow Place.” Tradition teaches that we must all see ourselves as though we personally were liberated from Egypt — and surely we have all known places and times of constriction in our lives from which we might yearn to be set free. But freedom by itself isn’t enough. We’re freed not only from, but also toward — toward covenant with God; toward Torah; toward the connective opportunities of the mitzvot. Shavuot is when we celebrate covenant and Torah. One midrash depicts Shavuot as our wedding anniversary, the date when we and God entered into an eternal covenant of connection. The Kotzker Rebbe was asked, why is Shavuot called the day of the giving of the Torah instead of the day of the receiving of the Torah? His answer is that the giving took place on one day, but the receiving takes place at all times. As my teacher Reb Zalman of blessed memory used to say, God broadcasts on all channels; we receive revelation when and where we are attuned. Join us on Saturday evening and Sunday morning for our celebration of Shavuot. (Details follow.) Along with our counterparts around the world, we will attune ourselves to experience revelation together once again. 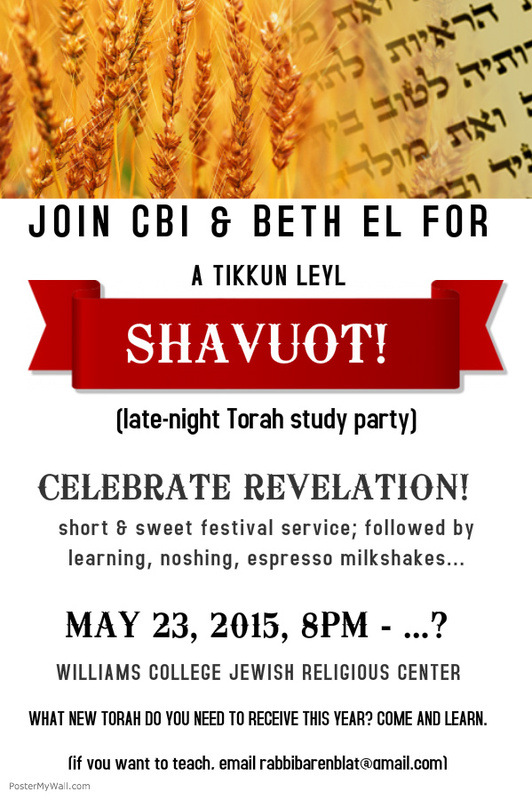 Tikkun Leyl Shavuot: 8pm Saturday night, Williams College Jewish Religious Center. Short-and-sweet festival service followed by joyous study. We’ll pause for havdalah when the time is right, then keep learning (and enjoying espresso milkshakes!) Stay as long as you like. Planned lessons include Sinai: Ascension of the Chosen?, Is Orthodox Judaism Compatible With Feminism?, What Would Moses Do: Distribution of Equitable Wealth in Torah, and Tonight’s Revelation: Writing a New Poem of Torah. Shavuot Morning With Yizkor: 10am Sunday morning, CBI. Festival morning services will include a reading from Torah as well as the Yizkor / Memorial prayers we recite four times a year. This is our summer opportunity to remember our beloveds and to reconnect. There will also be cheesecake. Shavua tov! 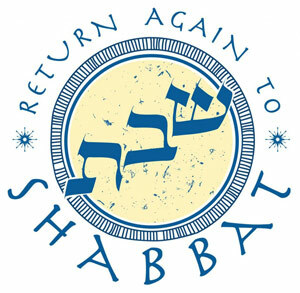 Looking forward to Shabbat Bamidbar – and to Shavuot! Shavua tov – a good week to you! This week we’re reading the Torah portion known as Bamidbar, the first Torah portion in the book of Bamidbar. In English, we call this book “Numbers,” but its Hebrew name means “In the wilderness,” which is where most of the book takes place. And here’s the URJ’s compilation of commentaries on this week’s Torah portion: B’midbar | URJ. This coming Saturday evening, May 23, we will gather to celebrate Shavuot at 8pm at the Williams College Jewish Religious Center with folks from Congregation Beth El in Bennington. We’ll begin with a short-and-sweet festival evening service and then dive into some joyful Torah study (and espresso milkshakes) which will run until late at night; come for as much as you like! And on Sunday morning, May 24, we’ll gather at CBI for Shavuot morning services led by Rabbi Pam Wax. We’ll have a festival morning service which will include Yizkor, the memorial prayers we recite four times a year. We have members who really want to have a minyan so that they can say kaddish during Yizkor in the presence of loving community; please join us. This week’s Torah portion, Behar-Bechukotai, teaches that every seventh year we must give the land a rest. Every seventh day we get Shabbat, a time to rest and be renewed; every seventh year the earth deserves the same thing. This is called the shmita year — in English, “Sabbatical.” And this year right now — 5775 — is a shmita year, which means that all over the world people have been talking and thinking and praying about how we can best care for our earth. This is a familiar category. Torah frequently speaks in terms of Israelites, outsiders, and the גר תושב (ger toshav), or resident alien — someone who is not originally of our community but is resident with us and among us. It’s a lovely inversion of the norm to say that even we “insiders” in the community are ultimately resident strangers, because when it comes to the planet, the planet belongs to God and we’re merely borrowing space on it for the short spans of our lives. Earlier this week I studied a beautiful Hasidic teaching about the verse “Y’all are resident-strangers with Me.” Usually we understand it to mean what I just said — that we are גרים ותושבים, resident strangers, on the earth which belongs to God. But the Hasidic master known as the Degel Machaneh Efraim offers a poignant alternative reading. He cites a verse from psalms: “I am a stranger in the land; do not hide Your mitzvot from me.” (Psalm 119:19) Someone who is a stranger, he points out, has no one close to them with whom they can connect and tell the happenings of their day. A גר תושב / ger toshav is inevitably lonely. When such a person does find a friend, he writes, then they can joyously pour out everything which has been in their heart. Here’s where he makes a radical move. He says that the Holy One of Blessing is a lonely stranger in this world, because there is no one with whom God can connect wholly. God is a resident alien, a lonely stranger, existentially alone. This insight really moved me. I know that we all have times of feeling alone, and the insight that God too feels this way — that our loneliness is a reflection of the Divine loneliness — changes how I relate to those feelings of loneliness. The Degel finds a hint of this in the psalm he cited. “I am a stranger in the land,” said the psalmist — as if to say, ‘God, like You I am a stranger in this world, so don’t hide Your connective-commandments from me!’ The psalmist is saying: God, like You I am essentially alone. I yearn for Your mitzvot, Your connective-commandments, to alleviate my loneliness. And God yearns for us in return. God is the lonely stranger, all alone in the world. We are the friend God finds, and when God finds us, God can pour out all of what is on God’s heart — in the form of Torah and mitzvot, our stories and our opportunities for connection with God. “Y’all are resident-strangers with Me” can mean: y’all are strangers just as I, God, am a stranger. Y’all feel loneliness just as I, God, feel loneliness. And because we are together with God in this condition of loneliness and yearning for connection, we are never truly alone. Join us to celebrate Shavuot! On the evening of Saturday May 23, we’ll begin our Shavuot celebration at the Williams College Jewish Religious Center together with members of Congregation Beth El (Bennington) at our annual Tikkun Leyl Shavuot. We’ll start with a short-and-sweet festival evening service and then dive into celebratory Torah study! If you would like to teach something, please contact Rabbi Rachel. On the morning of May 24th, beginning at 10 am, followed by an extended kiddush from hosts, Fern and Kenny Sann. Rabbi Pam Wax will be leading. It is traditional to eat dairy on Shavuot. “Torah is likened to milk, as the verse says, “Like honey and milk (the Torah) lays under your tongue.” Just as milk has the ability to fully sustain the body of a human being (i.e. a nursing baby), so too the Torah provides all the “spiritual nourishment” necessary for the human soul.” Rabbi Wax will be sharing a New York City cheesecake with us at kiddush, for the sake of sweetness and tradition. It is the memorial service recited four times a year in the synagogue. Fern and Kenny Sann and Pattie Lipman are requesting a minyan to say kaddish for their loved ones. thank you. *Shavuot שבועות means “weeks” and refers to the Jewish festival marking the giving of the Torah at Mount Sinai, which occurs seven weeks after Passover. Shavuot, like many other Jewish holidays, began as an ancient agricultural festival that marked the end of the spring barley harvest and the beginning of the summer wheat harvest. In ancient times, Shavuot was a pilgrimage festival during which Israelites brought crop offerings to the Temple in Jerusalem. Today, it is a celebration of Torah, education, and actively choosing to participate in Jewish life. Shavuot marks the conclusion of counting the Omer. With thanks to Aish, HebCal and the URJ.